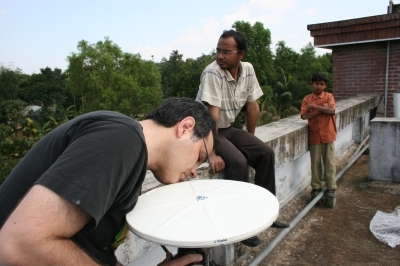 Participants from Lamont-Doherty Earth Observatory, Dhaka University, and the UNAVCO Facility installed 12 continuous GPS stations across eastern Bangladesh in February, 2007. The project, aimed at understanding the deformation associated with the Burma Arc subduction system, includes deployment of the GPS systems for 4 years and a rotating network of seismometers. The Burma Arc setting is particularly unique due to the large amount of sediment from the Ganges-Brahmaputra delta being incorporated into the subduction system, which produces a rapid broadening the accretionary prism and foldbelt. In addition, vertical velocities from the GPS data may allow for greater insight into possible subsidence of the delta. Each GPS site is equipped with a Trimble NetRS receiver and Trimble Zephyr Geodetic antenna. The receivers are programmed to record observations at 15 second and 1 second sampling rates. Due to the scarcity of bedrock and good sky view in Bangladesh, all of the antennas were installed on reinforced concrete column buildings; monumentation consisted of a 5/8" diameter stainless steel all-thread rod cemented into a hole drilled into the roof (Figures 1 and 2). The height of the antenna above the roof ranged from 13-30 cm. Eleven of the stations were powered by AC power from the host building with a 100 Amp-hour battery back-up. The site at Barkhol, accessible only by boat across Kaptai Lake, utilized solar panels and a custom designed solar panel frame (Figure 3), with 118 Amp-hours of battery back-up. Figure 1 - PI Michael Steckler of Lamont-Doherty Earth Observatory inspects the antenna mount. GPS station JURI is located at the Sagarnal Health Complex in the Sylhet Division of northeastern Bangladesh. Figure 2 - UNAVCO Project Engineer Nicole Feldl aligns the antenna at JURI as Dhiman Mondal, a student of Dhaka University, watches. 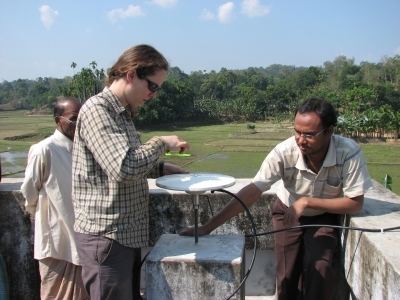 Figure 3 - PI Leonardo Seeber of Lamont-Doherty Earth Observatory and Dhaka University student Dhiman Mondal construct the solar panel frame. GPS station BARK, the sole solar powered station in the network, is located at the Barkhol Upazilla (local government) officer's residence, on the east side of Lake Kaptai in the Chittagong Hill Tracts of southeast Bangladesh.